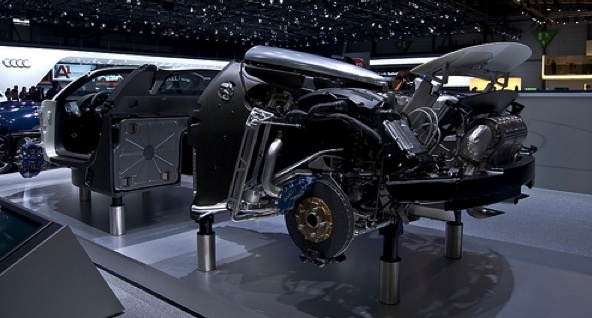 Editor’s note: Engineers love to take things apart to learn how they work. They call this a teardown. In his ongoing series of TC Teardowns guest author Steven Carpenter takes apart popular business models to see how they work. He’s done this with Groupon, Chegg, and Zynga. This time, he looks at handmade goods marketplace Etsy. A few weeks ago, Etsy, the New York-based marketplace for handmade goods around the world, raised $20 million in new capital at a $300 million valuation—3 times the valuation of its last round in January, 2008. In contrast to the meteor-like rise of Groupon and Zynga, Etsy’s revenues have grown consistently since its launch in 2005, while establishing a trusted brand and international platform for makers of all kinds of wares to sell their products. Based on my analysis, Etsy will do $380 million in gross merchandise volume (GMV) and generate $30 million in revenues this year, up from $180 million in GMV and $15 million in revenue in 2009. This implies a 10X revenue multiple in the company’s latest valuation, compared to EBay’s 3.6 multiple. The two key questions for Etsy are: How big is the market for handmade products? And can it continue to take share from eBay’s marketplace business? Let’s take a look at how Etsy makes money and how it can reach $100 million in revenues. Etsy provides an online marketplace where artisans can sell their wares to people looking for one-of-a-kind, handmade goods. Unlike sites such as eBay, Etsy does not run any auctions. All goods are for sale at a fixed-price. Based on data from Compete, 5.6 million people visit the site each month, up from 4.4 million a year ago, and that is after rebounding from a rapid fall-off in traffic following the holiday shopping season. (Click on charts to enlarge). The good news appears to be that Etsy is able to retain new buyers and sellers who try it out, presumably due to a great shopping experience. Etsy has over 6.7 million products listed for sale, half of which fall into just three categories: jewelry, art supplies, and vintage. 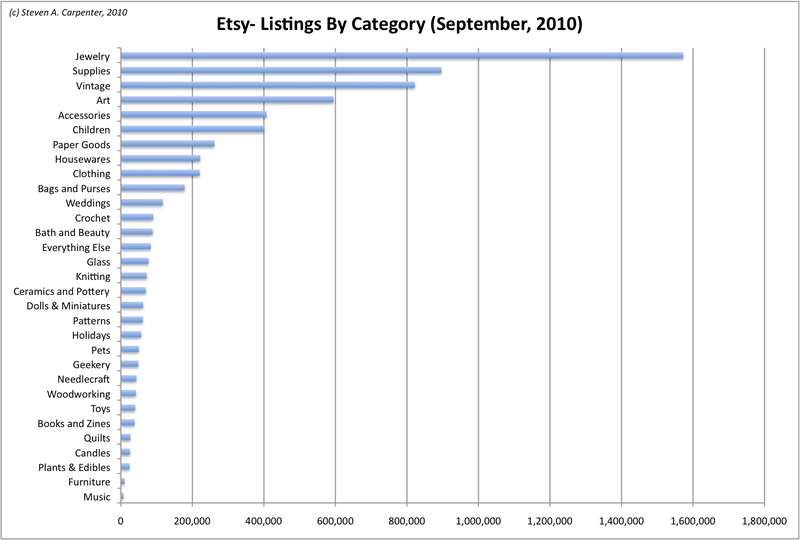 Jewelry alone, with 1.5 million listings, accounts for nearly 25% of all of Etsy’s products. While this is trivial compared to eBay’s 117 million listings, Etsy’s 6.7 million products are more than double eBay’s 3.2 million listings for similar handmade goods. 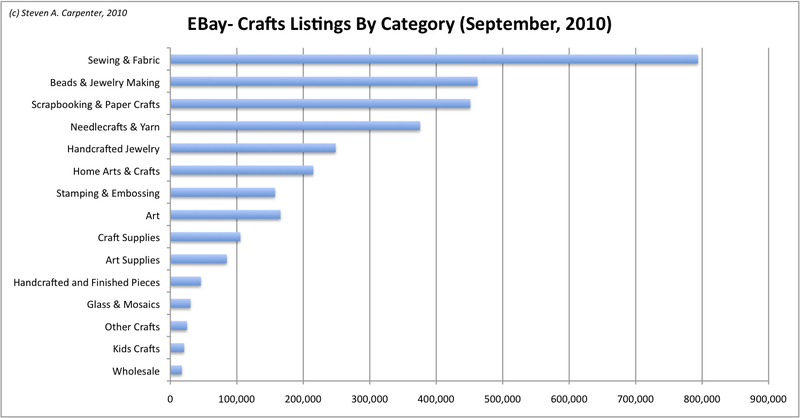 Ebay’s largest crafts categories appear to center more on hobbies such as sewing and scrapbooking, suggesting Etsy is attracting new sellers into the market. In a little over four years, Etsy has firmly established itself as the place to buy and sell items such as art, glass, jewelry and art supplies, among others. This suggests further that eBay continues to be vulnerable across other categories where 1) community is a core part of the selling-buying experience, and 2) the company has been unable to attract higher-end sellers. For a company of its age, Etsy has gone international exceptionally fast. It has sellers in over 150 countries and supports 23 currencies. It is rare for a startup to have garnered international demand so quickly and it is operationally very difficult to support. This is a huge competitive advantage. Etsy makes money in two ways: it charges sellers $0.20 to list a product for 4 months, regardless of the price of the item, and then it receives a flat 3.5% commission for each completed transaction. This contrasts starkly with eBay’s complex listing and commission structure. When you look at my estimates of where Etsy derives its revenue from on a monthly basis, two interesting things emerge. One, similar to other retailers, Etsy generates a disproportionate percentage of its revenues during the fourth quarter, suggesting the company is largely seen as a site for gifts. And two, while the business is driven by commissions, Etsy is seeing incremental revenue by keeping listing fees low so that sellers keep products on the system longer (ie, “Legacy Listing Revenue”). Let’s look a little deeper at each of Etsy’s revenue components. Gross merchandise value (GMV) is the total value of goods sold. Looking at this metric each month since January, 2008, this has been steadily growing, with December witnessing the largest sales volume. 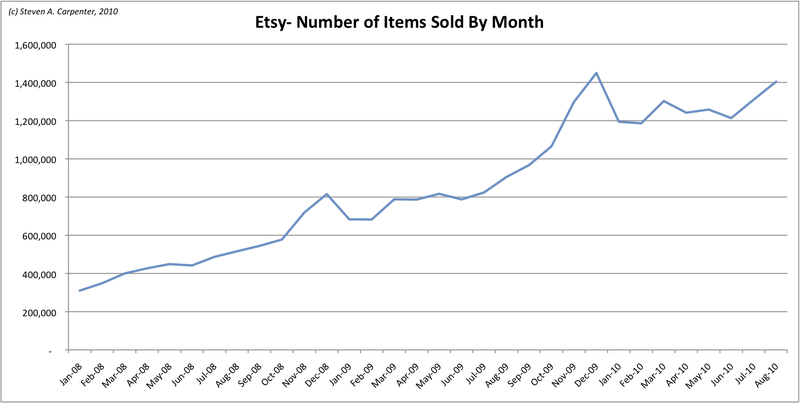 Last December, Etsy achieved its highest total of $25.6 million. After reaching a new plateau, the company sold $25.6 million worth of good. This holiday season should see 2X-2.5X last year’s sales. 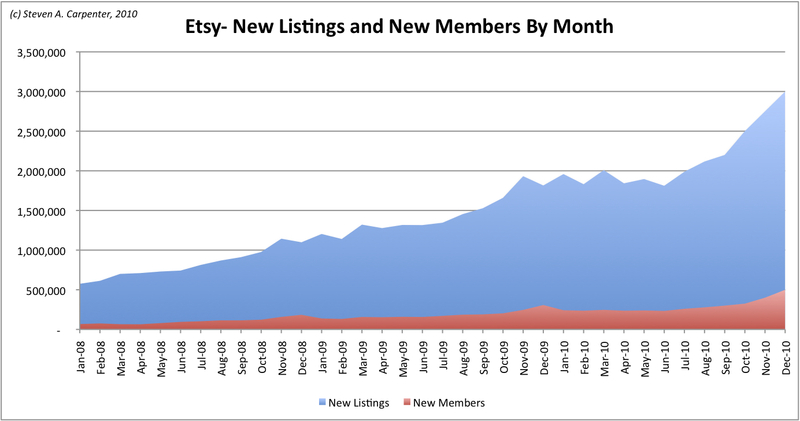 Etsy is also seeing steady growth in attracting new listings. As evidenced in the data, new listings are growing at a much faster rate than new members joining the site. This suggests that legacy sellers are continuing to value Etsy as a sales platform, but that it has to do more to attract both newbie sellers and buyers. Once consumers interact with the site and find something to either buy or sell, they seem to become loyal customers. In terms of the team and profitability, Etsy has not had to spend resources on advertising and marketing. 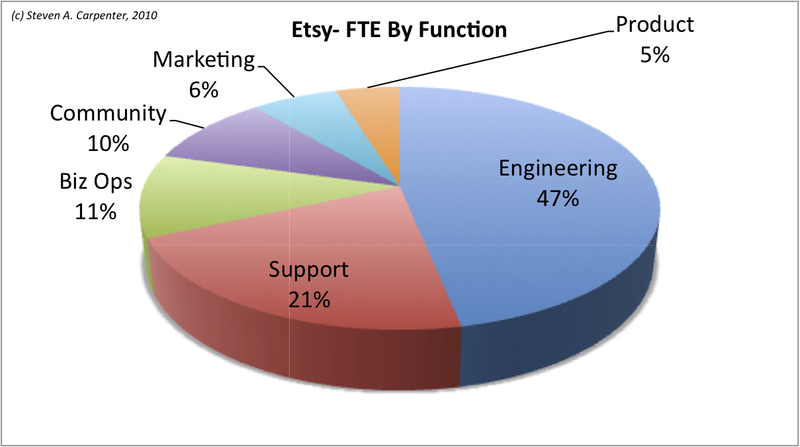 Etsy is an engineering and support-driven company, 90% of the people are either building the platform or supporting buyers and sellers. To put a fine point on this, Etsy has more people dedicated to its community (12) than it does to marketing (8). This suggests the company should be able to scale the business profitably without an outsized investment in customer acquisition. If you look at Etsy’s online marketing efforts, it spends next to nothing on customer acquisition. Attract More Sellers and Listings. As I discussed above, new users are not keeping pace with new listings. The company is already running local meetups, which is a smart strategy to take from eBay’s playbook. I am not sure if Etsy yet has an annual awards ceremony or eBay Live equivalent but there are many incentives the company could employ to encourage current power sellers to bring in new sellers and perhaps get a cut of their sales. Increase Merchandise Value. Etsy has done a good job of providing a trusted platform for sellers, which will naturally lead to higher-priced goods. It needs to continue in this direction and explore additional categories than are consistent with its brand position. Better matching of local supply-demand to avoid shipping charges. One of the biggest challenges to additional sales is expensive shipping rates. Etsy has to match local supply and demand and act as a matchmaker for similar or related products by geographic area. Improve Discovery On Site and Personalization. Etsy has a common problem for marketplaces in that it is very difficult to find certain products. I anticipate that the company will continue to improve in this area as well as in personalizing product and artisan recommendations. Last December, the company acquired a company called Adtuitive to presumably spearhead these efforts. Leverage Community Self-Selling and Sellers Groups. Etsy’s competitive advantage is that it has now reached the inflection point of a community of artisans. The company needs to allow those artisans to form collective seller’s groups and merchandise and advertise their wares together. The more Etsy can distribute its marketing efforts to the sellers themselves, the more it reinforces the community ethos and its economics. Address Seasonal Nature. With nearly 50% of gross sales come during Q4, Etsy needs to merchandise products around other gift-giving occasions, such as birthdays and holidays, and have its sellers market them. Create Additional Value and Revenue Streams. In May, 2008, Etsy launched a compelling service called Alchemy, that allows customers to put out a bid for custom-made goods. I looked at two random days over the past 2 weeks and counted 193 and 192 respective bids for goods. Right now Etsy allows this to be done for free, but this is an area where I can see a lot of promise. Furthermore, at some point in the near future it might make sense, given its international footprint, to create its own payment method.